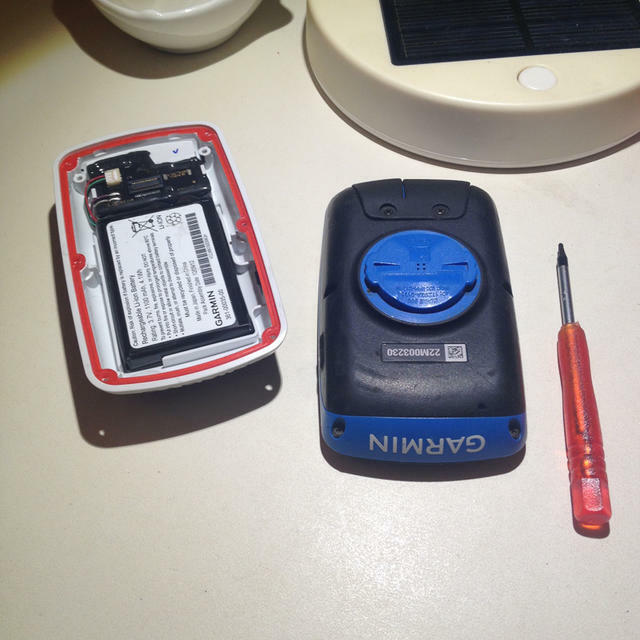 I just replaced the battery and back case on my Garmin Edge 800 bike GPS, it was pretty easy and as long as you have the right tools you shouldn't have any trouble. 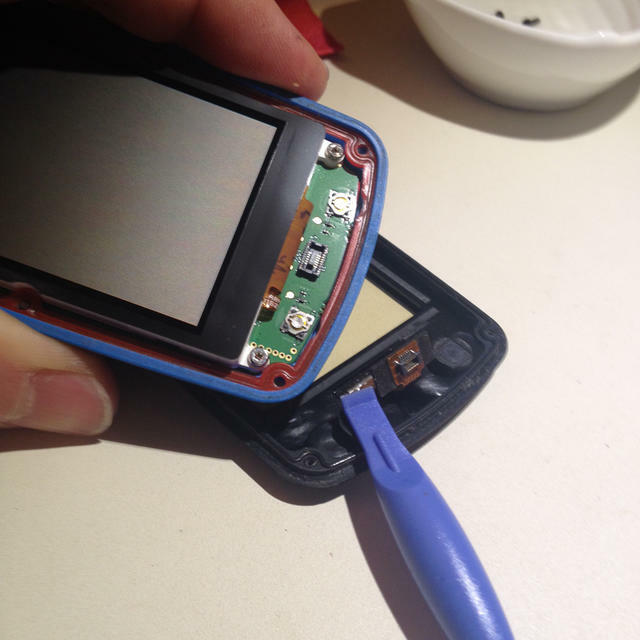 Just make sure you have good lighting, and make sure the small screws don't roll away. You should also make sure you're not causing any static discharge - ground yourself if you're in a carpeted or dry environment. BE GENTLE with the screws, fingertip tight is plenty. They will strip easily if over-torqued. Done! 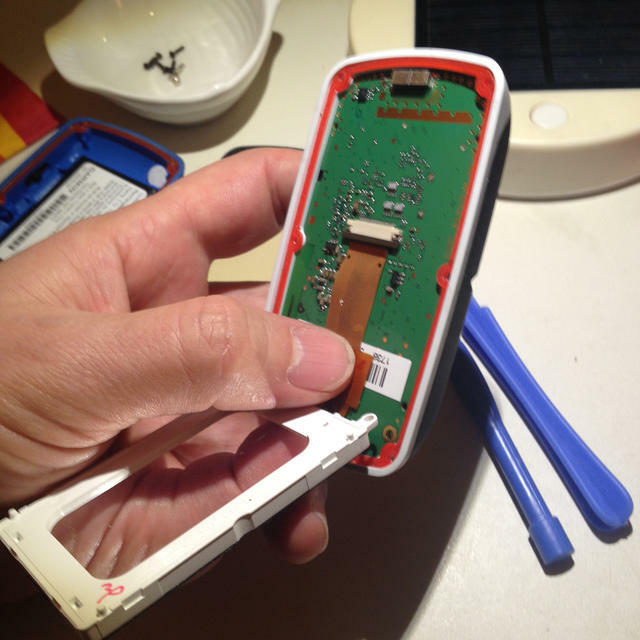 Now you have access to the battery, you can replace it or replace the entire back case. 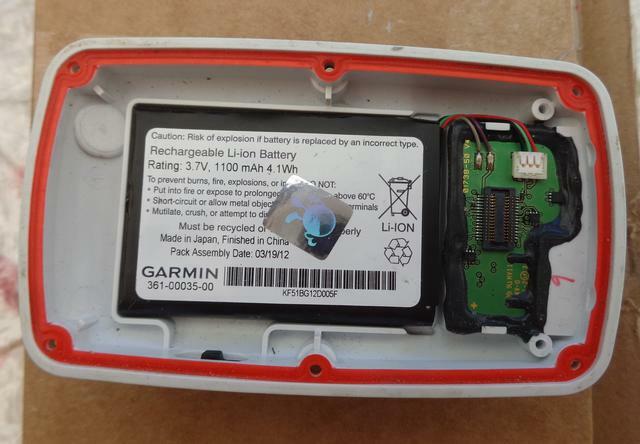 PLEASE NOTE that if you're planning to replace the entire back case, the new battery/connectors board may not line up with your existing main board. I think this is because the two boards were connected and then glued into the back case at the factory, for resistance to moisture. If it doesn't line up, you'll have to cut away all the glue with an Xacto knife, a very tedious process. 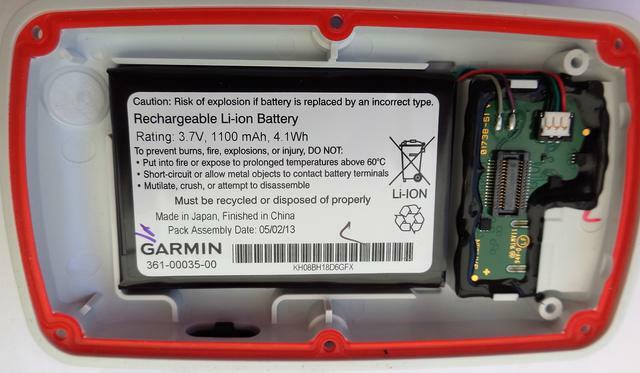 If you're just replacing the battery though, there's no change in the way things line up so you can ignore that warning. 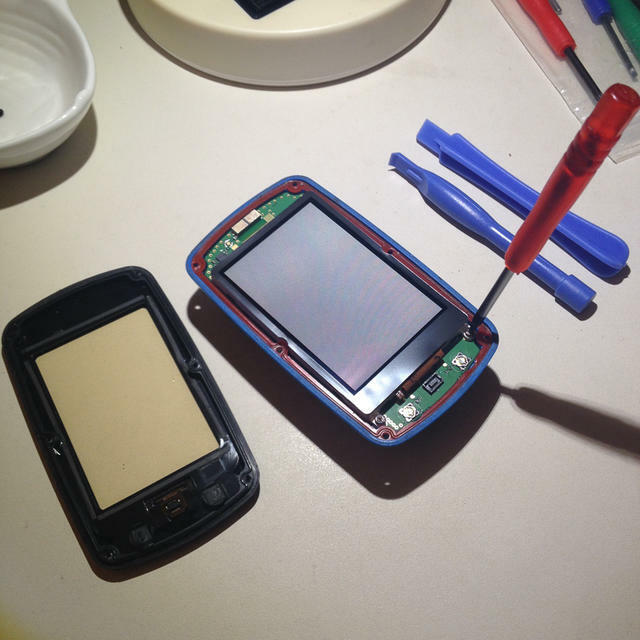 Assembly is, as they say, the reverse of disassembly. 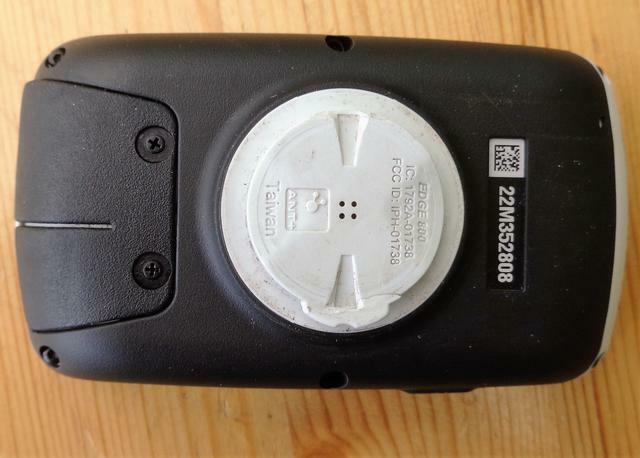 When reconnecting the main board to the back case board, it's helpful to flip the screen forward and press down on the area covered by the barcode. Very little force should be required for the connector to pop into place. 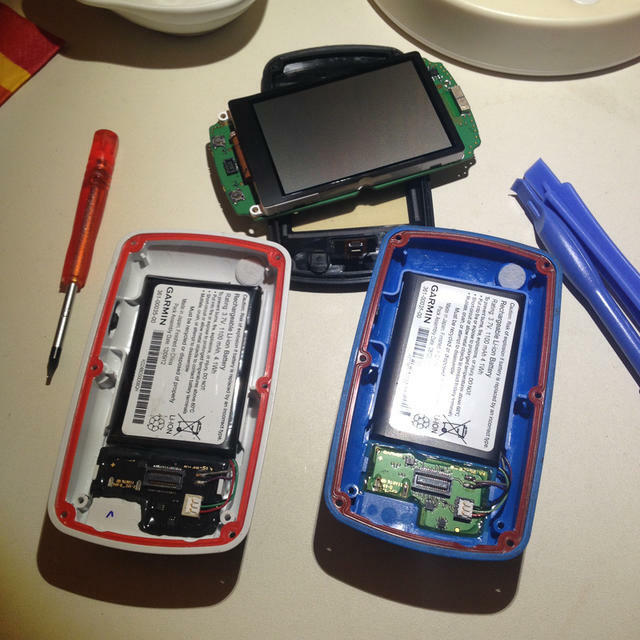 Please note that if you want to replace the back case, that you pick the right one. There seem to be 2 variants out there. One with a 10mm distance to the lower end of the case and 1 with 8mm distance. It's the part above the USB connector that makes the difference. If you pick the wrong one, it won't fit. This results in no connection between the battery and the main PCB. There seems to be a visible difference. The '8mm' has 3 circles (left to right) on that part and the '10mm' seems to have just one and a square above. Thanks, that's really useful information and probably explains why my my replacement back case didn't fit. Could you point out the 3 circles vs 1 circle with square area on the photo below? Not quite clear on where I should be looking. 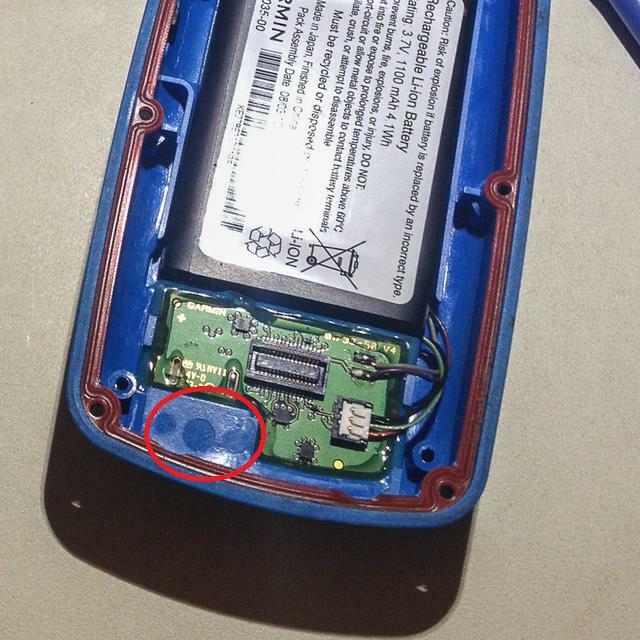 I attached a zoomed crop of one of the photos above, since the white & blue back cases/battery PCBs don't seem to be compatible, the markings should be different. I'm not sure about this, it's just a first conclusion for now. I don't have all kinds of cases lying around to prove a pattern. I also don't know if there is a difference between the black/white and black/blue version. All I know is that the Edge 810 has the 10mm version of the case. It seems that the 10mm one is the newest of the two. 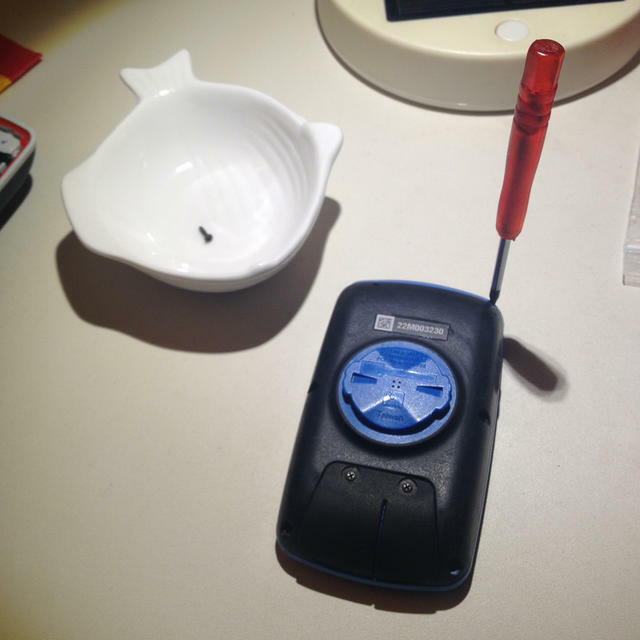 My Garmin has a version 2 main PCB and is in a 8mm version and I have had a version 3 PCB, which needed the 10mm case. That might help figuring things out. On the pictures I have shown you where to look for the marks. It's not solid that it works like this, but it's a start. the distance from that bit of the case should be 8 or 10mm from top to the inner side of the case below (along the line on the black/white case on the picture). Edited 1 time(s). Last edit at 01/27/2016 05:03AM by RJC88. Brilliant thank you again for circling that. Here's another picture with some info on this. I got this from eBay, where a seller points out this difference. It confirms my thoughts on the circles and square. On the outside there are no signs of this change. 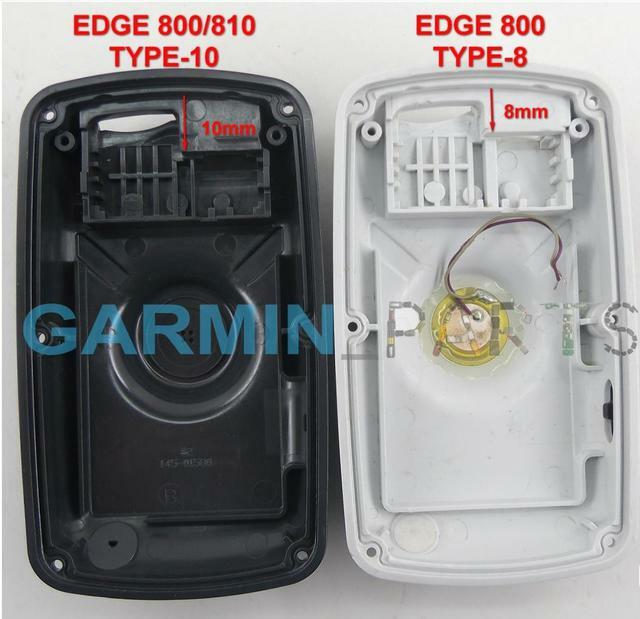 Also the case seems to be the same (on the outside) for Edge 800/810 and Touring (plus). The Edge 810 has the 10mm case. The 800 has two sizes. I will have to change a USB/SD board to another case, because it doesn't fit. The other case has a non working SD card reader. 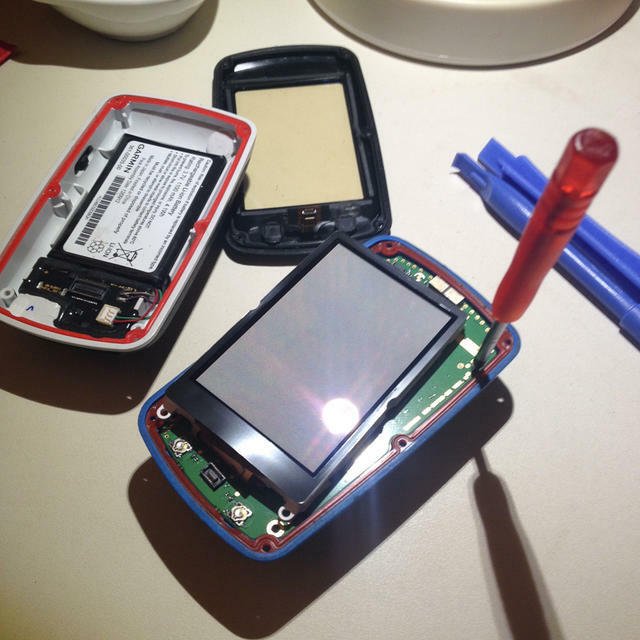 I hope I can get it water resistant again after that. I will report back on that, if you like. There's probably a way of telling from the serial number, but I have no idea what that would be. The only method I know of is the one that RJ described above, which requires disassembly. 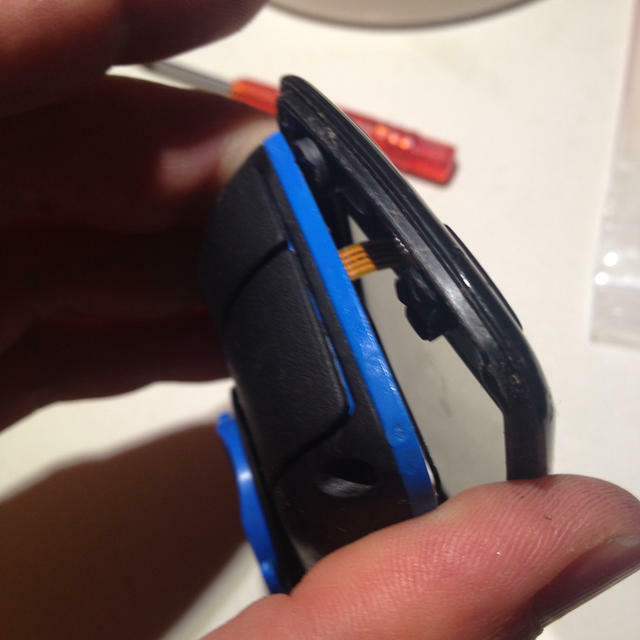 Just curious, how did the quarter-turn mount tabs break off? Crash your bike? I Dropped the unit when I was gathering up my cycle gear after a ride But was very surprised that on looking at it after It looked, it was only the next time I was out on the bike the I noticed it jumping around in the mount so then I saw the damage I just got another case with the battery and the calked in memory card and usb unit I just need to take the back case off my unit to see if the cases are compatible and if so that I perhaps can just change the pcb and screen over an d it might work though as bought the other back case off ebay feel sure that knowing my luck I will have to take the M/card and usb circuit out and put mine in which as you say will be a labour-some task I will just post a pic of the back case I bought all I have to do now is see if it works! Edited 1 time(s). Last edit at 08/05/2016 01:14PM by Ant. Hi Well that was really a kind offer but as I said I have got a new mount from a company here in the UK and have used expoxy resin to fix it on to the broken one it lifts the unit up a little but is a solid job and stays in place firmly. so I'm well chuffed! You mean the Dog Ears solution? Never tried it, but seen it on some devices. I don't think it's a good solution, since it it a weak connection to the case and puts a lot of strain on a small area. This on the part that has to endure a lot during a ride. I have not found any relation between serial no. and type of case. I found out that removing the USB/SD board was easy. Just remove the sealant and pop it out with a needle. Replacing it wouldn't be such a hard thing to do. 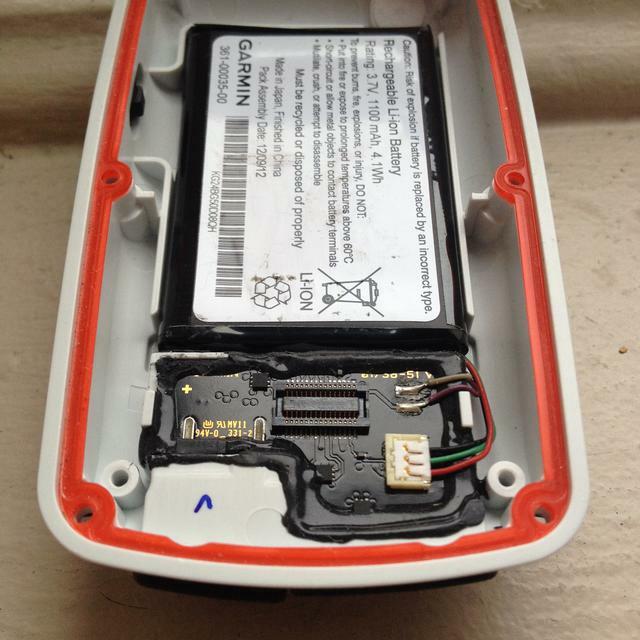 I never had to place it back and make the case water resistant again, so that is still a thing to figure out.